I love using a pesto as a sauce for pasta. 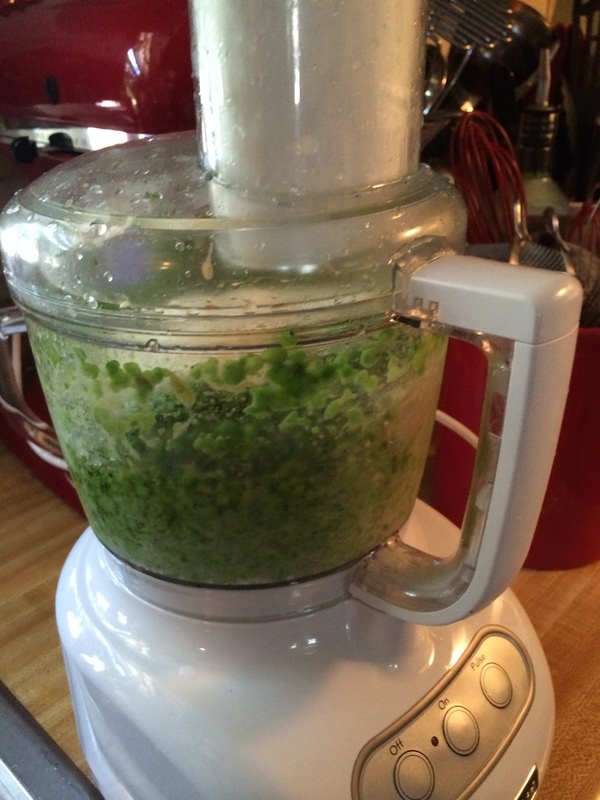 Pesto doesn’t over power any dish but it’s a freat condiment for pasta and adds so much flavor. I’m going to top the pasta with a spicy grilled chicken breast. The chicken is marinated in a the Greek yogurt flavored with blackened seasoning. 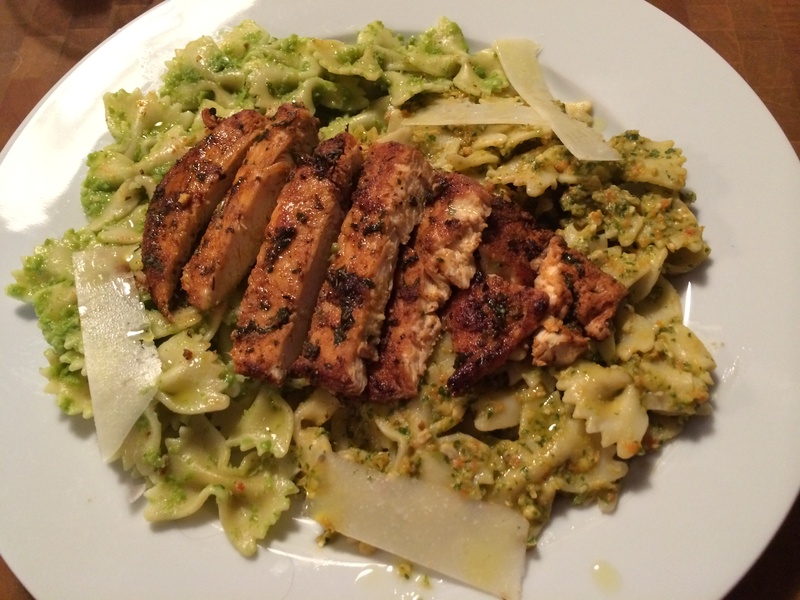 Above is a picture of a similar pesto I’d made earlier. It’s my sweet pea and mint pesto. The same process is followed to make this version. 2 skinless-boneless chicken breast, butterflied then sliced into 2 breasts each, yielding 4 thin chicken breasts. In a large dry sauté pan, on medium heat. 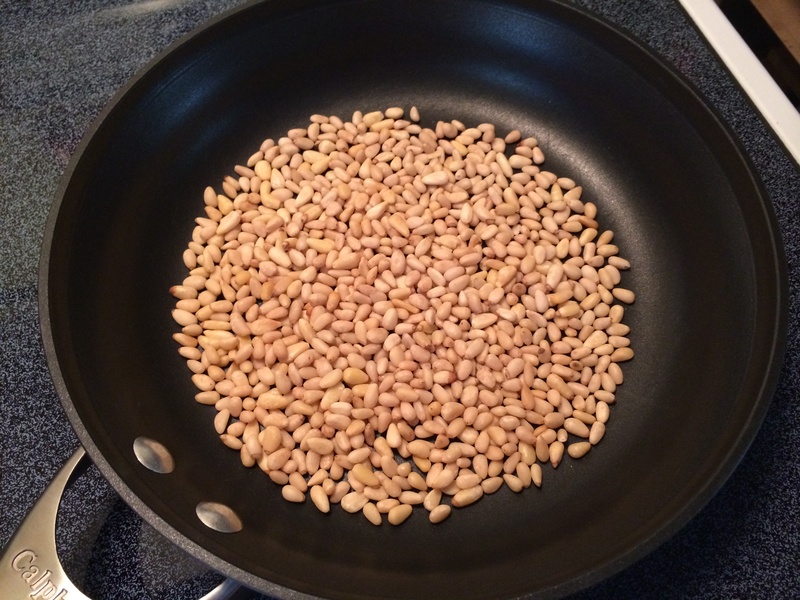 add the pine nut. Toast until the nuts become fragrant. Remove from heat. In a food processor, add the Cannellini beans, roasted red peppers, lemon juice, garlic, Kosher salt, black pepper, arugula. Drizzle in the E.V.O.O.through the feed tube around 6-8 times. Remove the lid, add the grated cheese, pulse a few more time until cheese is combined. Add more E.V.O.O. if needed. The finished pesto should have a smooth consistency. Transfer to a bowl. Cook the bow tie pasta according to the box instructions. Drain well. Toss the pesto with the hot pasta and set aside. In a large bowl, add Greek Yogurt, Agave nectar, blackened seasoning, Kosher salt, and grated garlic, mix well. Add the 4 thin chicken breasts. Make sure all the chicken is coated well with the seasoned yogurt. Cover bowl with plastic wrap and transfer the refrigerator for 1 hour. Preheat indoor grill pan on med-high heat. Have the oven set on 250 degrees F. Place the chicken breast on grill pan. Grill the first side for 3-4 minutes, flip the chicken and grill for another 3 minutes. Transfer the grilled chicken to a sheet pan and place in the oven to stay warm. Cook pasta, drain well. 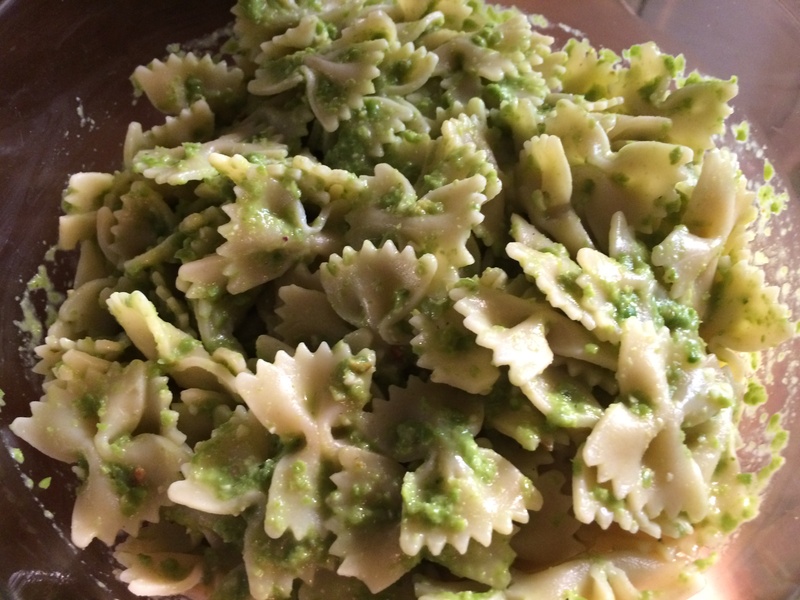 Transfer the pasta to a large mixing bowl, add the prepared pesto and toss. Remove the chicken from the oven. On a cutting board for meat, slice chicken on the bias. Add the pasta to a large serving bowl, top with sliced grilled blackened chicken. 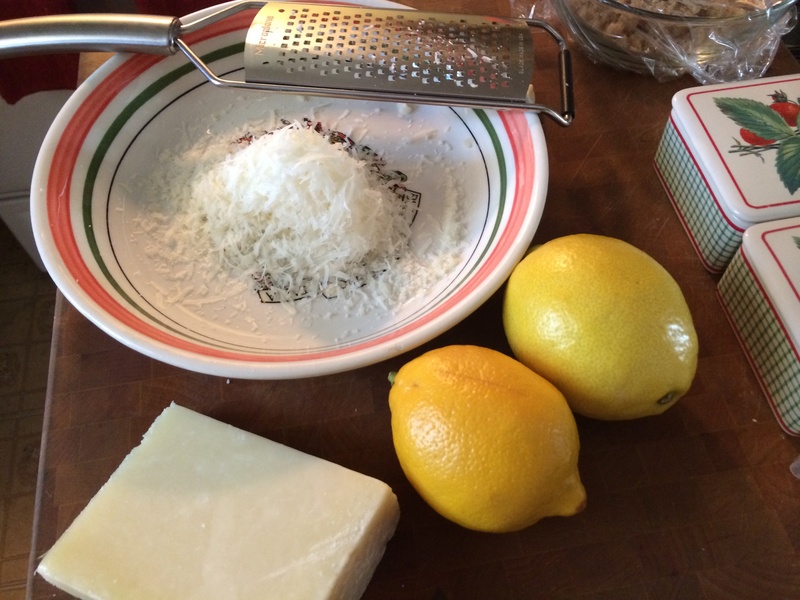 Garnish with shavings of Parmigiano-Reggiano cheese. 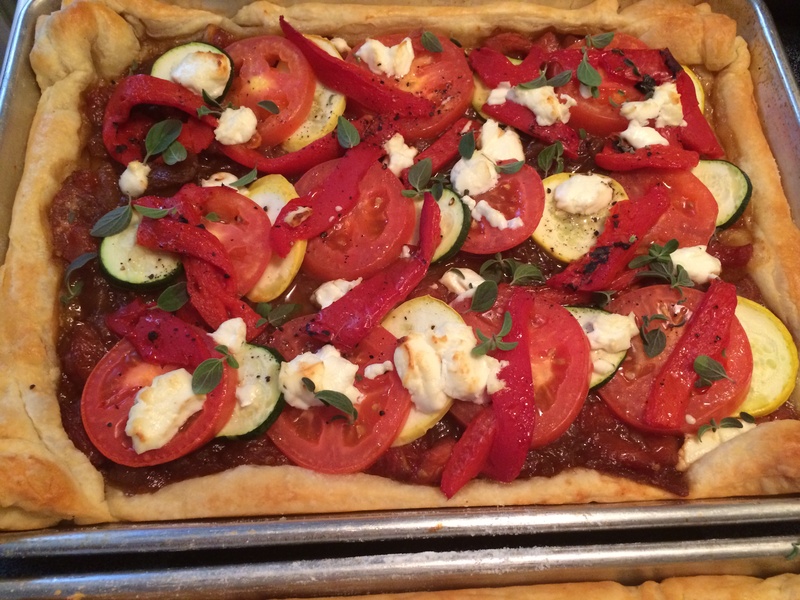 This Zucchini And Tomato Tart With Goat Cheese is a great alternative to eating meat. It really satisfying and delicious. The jam takes quite a while to make but the good news is you can make it in advance. 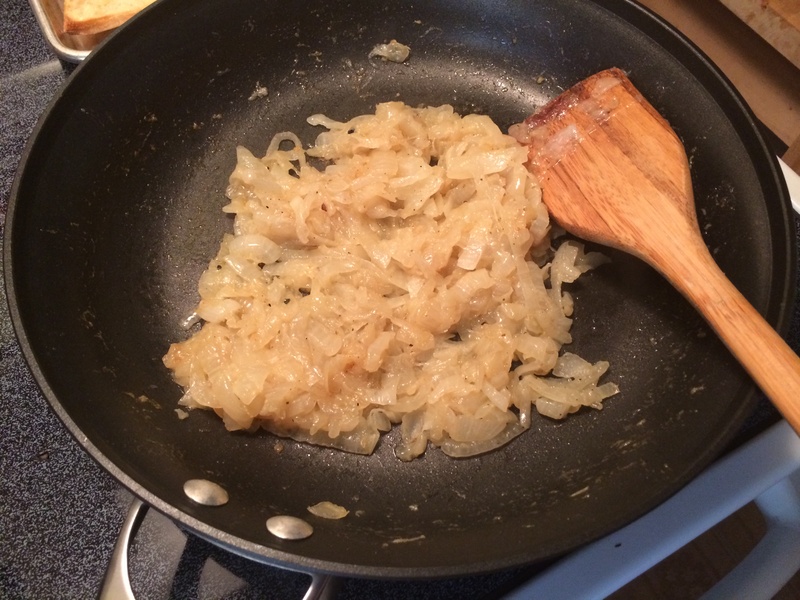 First, you want to caramelize the onions. Start with a sweet onion like a Vidalia. Vidalia onions are really the best ones to use for this dish because they’re naturally sweet. In a large non-stick sautèpan on medium heat, add olive oil. 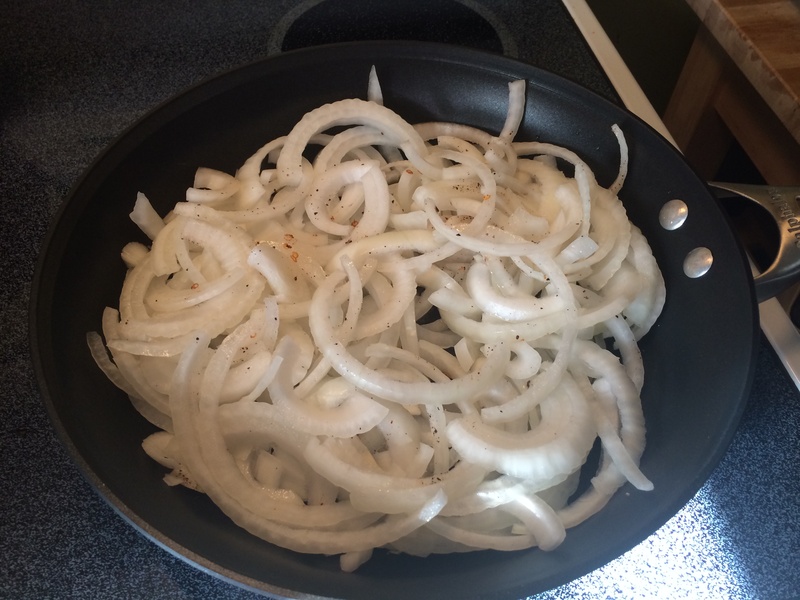 Add thinly sliced onions, sugar, Kosher salt, and freshly cracked black pepper. 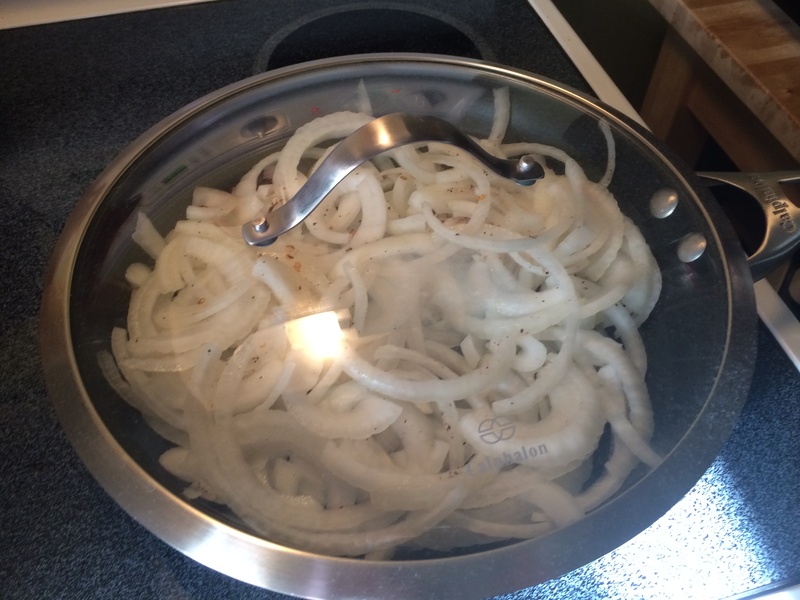 Place a lid on the pan to give them a head start in softening, about 5 minutes, remove the lid. Sautè the onions stirring every few minutes, preventing the onions from sticking to the bottom of the pan. Adjust the heat to medium-low if you see the onions are starting to burn. Cook until they become soft and caramel in color, about 40 minutes. Next, to the caramelized onions add the quartered and seeded Roma tomatoes, apple cider vinegar, fresh lemon juice, granulated sugar, light brown sugar, crushed red pepper flakes, ground cinnamon, and ground cloves. Turn the heat up to medium bringing the mixture up to a boil reduce heat to a slow simmer, stirring occasionally until the tomatoes have broken down and jam has thickened and developed a jammy consistency, around 1 to 1 1/2 hours. Remove from heat and set aside. Line 2 rimmed baking sheet pans with parchment paper. Thaw Puff Pastry according to instructions on the package. Once thawed, roll the sheet into approx. 11 x 13-inch rectangle. Transfer the sheet of Puff Pastry onto a lined baking sheet. Prick the center of the sheet of dough all over with a fork leaving a 3/4-inch margin on all sides. This way the center won’t puff up during baking. Repeat this process for the second sheet of Puff Pastry. Transfer the 2 baking sheet pans into the refrigerator to chill the dough, about 15 minutes. Using a mandolin (is a tool that allows you to make the vegetable slices uniform in thickness) slice the zucchini, yellow squash. Next, using a very sharp knife slice the Roma tomatoes 1/4-inch in thickness. After 15 minutes, remove the pans from the frig. 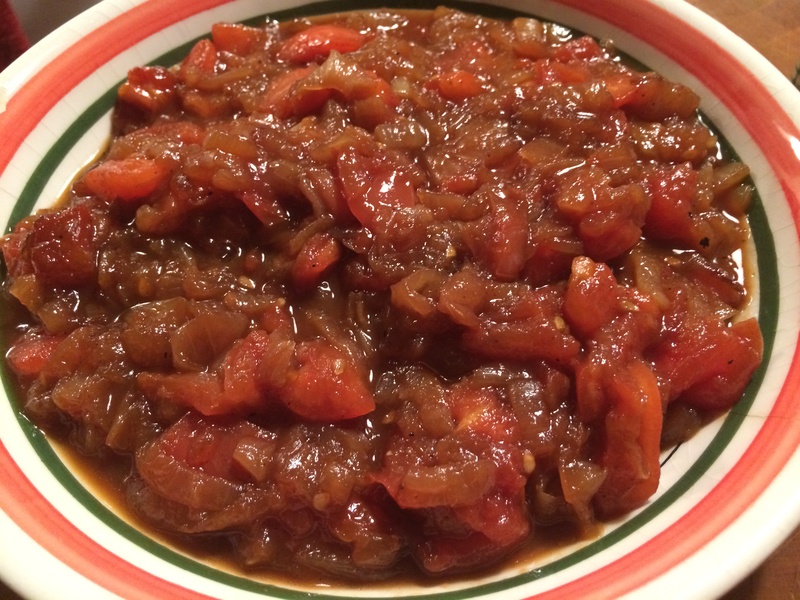 Divide the tomato onion jam between the two sheets of dough. Spread the jam all over leaving the 3/4-inch border on all sides. 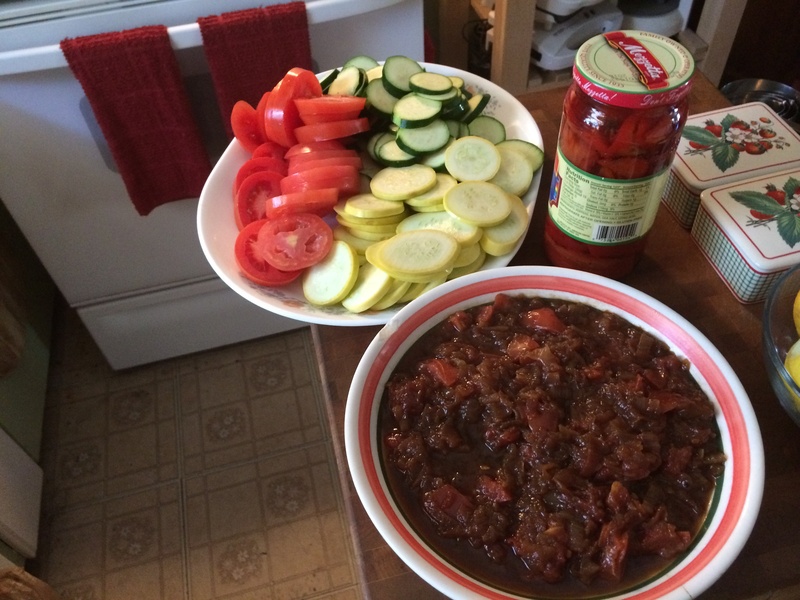 Next, layer the sliced zucchini, yellow squash, and sliced Roma tomatoes alternating them in color. Repeat process for the second sheet pan. Crumble goat cheese over all the veggies. 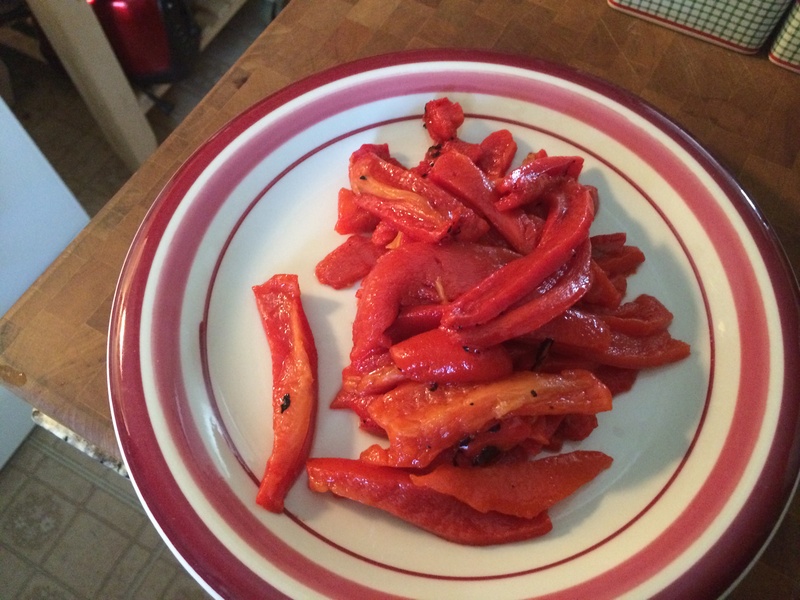 Lay the julienned roasted peppers, here and there, on top. 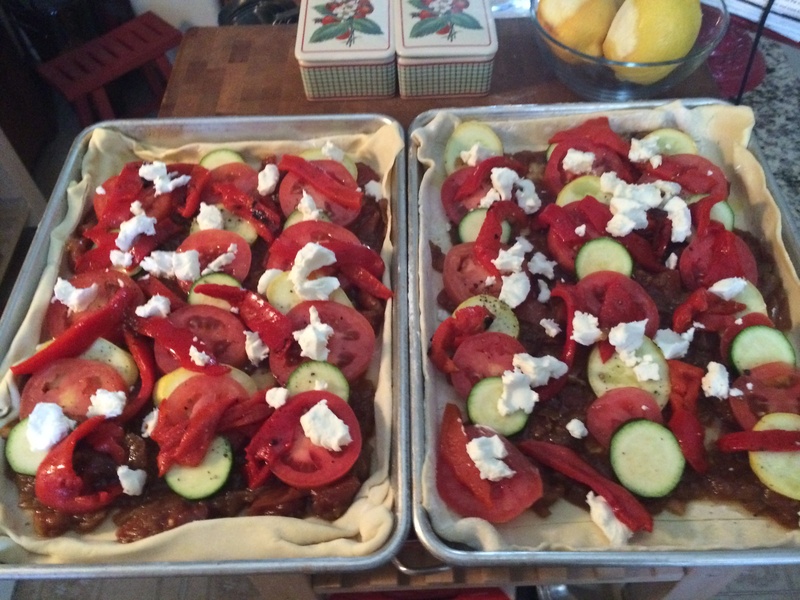 Drizzle the top of each tart with olive oil, then sprinkle each with Kosher salt and freshly cracked black pepper. Brush the edges of the Puff Pastry with an *egg wash. Bake for 15-20 minutes or until it’s nice and golden brown in color. Garnish with fresh oregano (or basil leaves) leaves. *Egg Wash: Whisk together 1 beaten egg and a tablespoon of water or milk. *Mandolin: A tool that allows you to slice vegetables in several widths and thicknesses.